Fall is quickly approaching, in fact the first day of Fall is Saturday September 22nd...yes like a few days from today. Depending on the part of the country that you live in, it probably still feels like Summer. Here in Nashville the temperatures have been in the upper 90's pretty consistently the past few weeks. If you have been shopping over the past few months, most retailers have been stocking their stores with Fall Fashions since mid July. This can be a blessing and a curse. For those that went back to school this was the time to stock up on basics to start the school year. However if you are not a student, or have students in your home you may feel like the stores may have jumped the gun, similar to going to Hobby Lobby in July and they have Christmas decorations fully stocked...Right?! 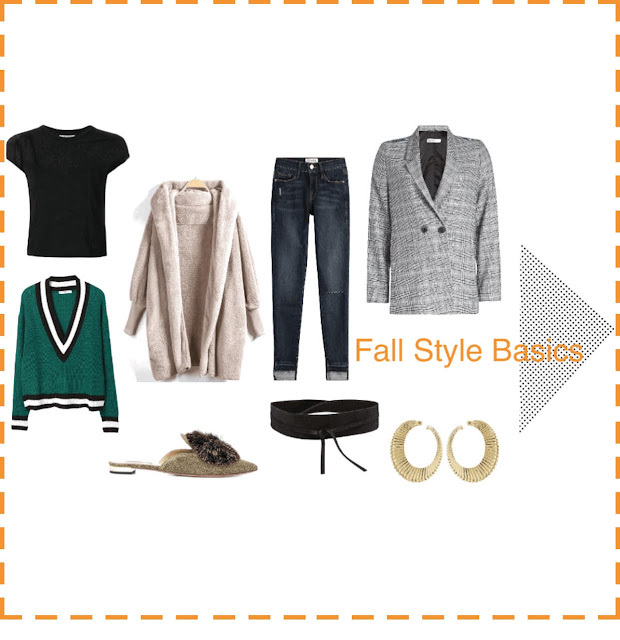 The early Fall in store transitions can work in the average shoppers favor because the typical store "life span" of certain items will be in stock for 6 weeks before they start to mark down/clearance out style pieces. What that means is cheaper prices & you will also be able to shop the 2nd flow of Fall styles when the temperature finally does get a chill in the air. Crew neck t-shirt - This is a wardrobe staple that should be refreshed every season, especially the colors white & black for sure. Crew necks make great layers pieces under blazers, transitional summer dresses & sweaters. Tried & true staple colors to have in your closet are white, black, red, heather gray and a stripe color. Good stores to shop for quality crew neck t-shirts are Target, Zara, Gap, Old Navy. Collegiate Style Sweaters - These sweaters are definitely for the preppy at heart and can be paired with skinny jeans, khakis & even skirts. Long oversized cozy/fluffy sweaters - Cozy sweaters are my go to wardrobe staple because I am always cold. The fluffy sweater can be styled with skinny jeans & even leggings. (FYI: I have a love hate relationship with leggings) however structured leggings pass my style test. Accessory: Thick Hoops - Whether gold or silver, a pair of thick hoops just boost any casual style look up a notch. Good places to shop for hoops is H&M, Charming Charlie, Target and many other retailers. Skinny Jeans - You can never go wrong with a great fitting dark wash skinny jean. I would suggest a pair that is not distressed & also one pair of distressed for casual weekends. Dark washed skinny jeans can be incorporated into your office attire when paired with a blazer on Casual Friday. The distressed jean can be paired with the crew neck t-shirt & long cozy sweater! Blazers/Regular + Oversized - Great for the office, weekends with the girls & also date nights. the oversized blazer can be paired with skinny jeans. The oversized style blazer can be belted in order to create a waist line for your overall style. I am personally on the hunt for a plaid and/or herringbone blazer for the Fall. Belts - a good belt adds structure and dimension to you style looks. Skinny, structured & wide style belts. Mules - My personally prefer embellished styles, but the classic mule is a good transition piece from Summer to Fall. If you can tell the pattern with this list of 8 Must haves, they can all be paired together & work with other style pieces in your current closet. The key is to maximize your wardrobe by mixing & matching new and existing wardrobe pieces.